We should all learn to subdue ourselves and practice self-discipline by getting rid of bad habits and wasteful desires. If we try to find happiness by pampering ourselves extravagantly, we let our precious lives pass by in vain, and we even accumulate bad karma. Only when we live with simplicity and frugality will we be able to put minimum strain and impact on the environment and prevent disasters from happening. When we lead a frugal but diligent life and take every opportunity to help others, we set a good example for our children to follow and pass down the formula for happiness from generation to generation. With Lunar New Year approaching in February, I am grateful for having led a peaceful life throughout the year. If we can be free of torments or disasters, we can pass our days quite comfortably. However, many people around the world weren't so fortunate in the past year when many countries were tormented with natural calamities. Torrential rains, hurricanes, droughts, and forest fires drove people from their homes or, worse, took people's lives. For those hit by catastrophes and living without food or shelter, a single day could feel like a torturous year that seemed to drag on without end. Those natural disasters serve as Mother Earth's repeated warnings to human beings that she has been hurt badly. How can people repair the damage that they have inflicted on the planet? It can only be done with love. Three years ago, a huge undersea earthquake centered off the west coast of Sumatra, Indonesia, triggered a series of devastating tsunamis. Hundreds and thousands of people living across 11 countries adjacent to the Indian Ocean perished within just a few minutes. Our volunteers at Tzu Chi branch offices in such countries as Indonesia, Thailand, and Malaysia rushed immediately to the disaster scenes to offer all necessary help. Tens of thousands of people in Sri Lanka also died in the tsunamis. Although Tzu Chi had no branch office or volunteers in that country at the time when the disaster hit, lots of our love went in soon afterwards. Within 60 hours, Tzu Chi managed to mobilize many volunteers to transport emergency supplies and medical care to the disaster sites in Sri Lanka. Those relief missions would not have been possible without the efforts made by Tzu Chi volunteers and many kind-hearted people, including Taiwanese businessmen working in Sri Lanka, people who donated money or goods, physicians and other medical personnel at Tzu Chi hospitals, members of the Tzu Chi International Medical Association, and people who helped transport goods and medical supplies to the survivors. In sum, it was a great mission made possible only by a lot of teamwork. No sooner had the volunteers settled the victims in temporary quarters than they began initiating a plan for constructing permanent homes for them. The Tzu Chi Great Love Village in Sri Lanka opened in 2007. More than 600 tsunami-displaced families moved into their new homes. Tzu Chi National School, built within the compound of the village, was opened in January 2008. 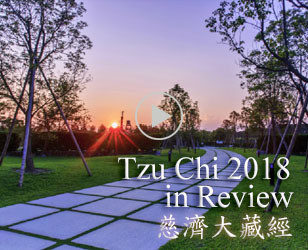 Over the last three years, Tzu Chi people have kept their promise to accompany the survivors through the hardest times of their lives. Emerging from the wilderness, a vibrant, well-organized new community has been created. It is a great delight to see flowers blooming in each family yard and animals roaming about the community lake and beyond. During the planning and construction of the community and school, several Tzu Chi construction commissioners such as Lin Zhong-chi (林仲箎) and Wang Ming-de (王明德) made numerous trips back and forth between Taiwan and Sri Lanka to ensure the quality of the project. These commissioners mindfully took all the prospective residents needs into consideration when inspecting the quality of the construction as if they were building the community and school for themselves. 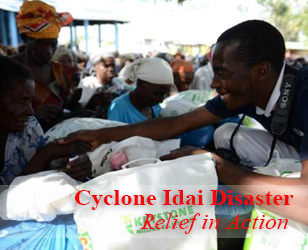 Donations made or solicited by Tzu Chi volunteers throughout the world made our aid to Sri Lanka possible. Every penny of the donations has been used to help the residents of the Great Love Village settle down both physically and mentally, make their lives stable in good-quality houses, and provide their children with a school where they can study. I believe this act of Great Love--giving while asking for nothing in return--will take root in this piece of land and will be passed on from generation to generation. A small seed of goodness and compassion, when pooled together with many others, will generate a force powerful enough to benefit numerous needy people. I do hope all of you can help scatter seeds of love all around the globe. The world can still be full of hope if we can motivate more people to improve our world. Life can be reset just as garbage can be recycled. We can regain happiness by getting rid of worries, and we can cultivate a sense of goodness by eliminating our bad habits. Earlier this year, Naples, Italy, faced a major public health crisis. All their garbage piled up in the streets because people had nowhere to throw it away. Trash collection ceased in December 2007 as all the city's landfills were full. The government prepared to reopen some dump sites that had been closed for many years. This of course provoked strong protests from residents who lived close to those sites. Police attempted to stop people from dumping and even burning rubbish on the streets. This again induced violent confrontations. Garbage disposal has become a difficult problem to deal with in many places indeed. Fortunately, Taiwan has many recycling volunteers. They carefully sort out garbage and reclaim resources. In this way, they succeed in reducing the quantity of disposed items and keeping communities clean. Manufacturing goods from recycled materials also effectively reduces the consumption of the earth's resources. Recycling work benefits society and oneself. After participating in collecting and sorting recyclables, many volunteers realize how arduous this work can be. As a result, they discipline themselves to adopt a thrifty lifestyle and do their best to appreciate the resources that they use. Through participating in recycling, many people at Tzu Chi recycling stations even rediscover lost happiness and health. We have seen numerous examples of people who were originally afflicted with depression or drug addiction cleanse away the garbage in their minds through the act of sorting through physical garbage. They find joy and strength to start life anew and bring happiness back to their families. Take Grandma Chen Qu (陳屈) for example: She began suffering from dementia several years ago and gradually lost the ability to take care of herself. Eventually, she refused to leave the house. Her children were very worried about her. Hoping to help break her isolation, they took her to a Tzu Chi recycling station. In the beginning Grandma Chen was very angry, but she became happier and happier with the passage of time. As she sorted through garbage looking for usable items, she gradually tossed away whatever unpleasant feelings there were in her mind. Her mental abilities and physical functions returned. She no longer utters words that nobody can understand. Now she is more than happy to do recycling work. Life is full of suffering. When they enter the big family of Tzu Chi, many people convert unhappiness and suffering into joy and vice into goodness. Why? It is because people in this family really care about each other, and they all encourage and help each other to grow. As the positive power of many people converges together, there will be more strength to make our society a better place to live. You create blessings when you do good deeds without expecting anything in return. Your wisdom is cultivated when you open your heart and mind and toss away worries and perplexity. When you make your humble contribution at a Tzu Chi recycling station, you cultivate both blessings and wisdom. In addition, the money from the sale of recyclables is used to support the Tzu Chi Da Ai (Great Love) TV station, which broadcasts news of purity and love throughout the world. The recycling volunteers merits are boundless. Let us subdue our desires and cherish the things we have. We will beget blessings if we can reduce our material needs, learn to enrich our minds, and give of ourselves to benefit others. Jian Bi-lian (簡碧蓮), a Tzu Chi commissioner who lives in Taipei, is an example of self-discipline. Her family of six lives sparingly on her husband's meager salary of US$900 per month, but they are rich with love. Jian saves laundry water to flush the toilet or mop the floor. When she steams rice, she puts vegetables in to be steamed at the same time in order to save electricity and gas. When her second daughter was to be married, she gave her a carload of used furniture. The only "new" presents to the newlyweds were a vegetarian recipe book and a DVD of a Tzu Chi drama teaching the daughter how to be a good daughter-in-law. People might be curious whether their daughter and son-in-law appreciated the "secondhand" presents. Yes, they did, because they knew the importance of self-discipline and frugality. After they got married, the couple opened a breakfast stall. They even practiced true frugality in their lives by making all the tables and chairs for the stall themselves. Another good example for us to follow is Jian Dong-liang (簡棟樑), who lives with his wife and children in Taichung. To save on electricity, Jian set up his study on the veranda in front of his apartment. He doesn't need to turn on any lights when he reads. After seeing what a frugal and simple life their parents lead, the children naturally live with few material desires. Although the whole family keeps their material needs to a minimum, they lead a happy life. Moreover, they even make charitable donations with the money they save out of their daily expenses. When you subdue all unnecessary desires, you will naturally have extra money to help others. These two couples set good examples for their children to follow. If society can have more families like these, we will see more hope for tomorrow. To practice frugality, you need to begin with self-discipline--discipline yourself to get rid of bad habits and cravings. Many people nowadays indulge themselves. They want everything to be extravagant and convenient, and they only look for famous brands and fashions. 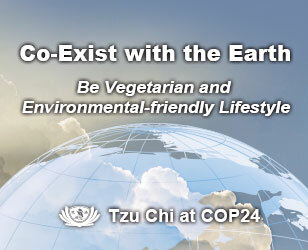 Such a lifestyle creates environmental problems. Many things at the Tzu Chi recycling stations are still usable; they were discarded just because they were out of fashion. For the sake of convenience, many people are used to buying bottled water, which dramatically increases the production of plastic bottles. To satisfy their vanity, some young people crave luxurious goods so much that they put themselves in debt. Even when in debt, they still cannot control their desire to lead a lavish life. Unable to pay their debts, some choose to end their lives by committing suicide. How sad and pitiful! Pampering ourselves, we let life pass by in vain and create much bad karma. If we can live a simple life with few desires, little harm will come our way. In addition, we must work hard, take good care of our family, and live a disciplined life. When we have the ability, we should serve others. Such a life of unselfish giving will have great quality and priceless value. Let's safeguard our minds from delusion and complaints by bravely facing the reality of life. Furthermore, we should dignify ourselves by doing things that can benefit others. As the Chinese proverb goes, "Small wealth comes from frugality; great wealth is bestowed on us by heaven." We should cherish everything we have, even a shirt or something as tiny as a drop of water. "Heaven" refers to our fate in this life, which was decided by the accumulation of all the things we did in our previous lives. In Buddhism, it is the law of cause and effect--we always reap what we sow. In other words, if we sowed good causes by helping others in our previous lives, then naturally we will reap good fruits in this life. Zhu Shu-xia (朱淑霞), a Tzu Chi commissioner living in Banqiao, Taipei County, led an impoverished life. She had four children; two of them died of illness, and one has recently been diagnosed with cancer. Although life dealt her many hard blows, she accepted her fate because she knew it was useless to argue with heaven. She bravely faced reality without complaining, and she took every opportunity to do good deeds. Seeing how Zhu dedicated herself to doing recycling, her husband was impressed. Besides inspiring her husband to pitch in to help with recycling, she has also inspired many friends and neighbors to engage in charitable activities. The script of your life was pre-written by yourself in your previous lives. What you do in this life will be the script for your next life. In other words, whatever you receive in this life is the result of what you sowed in the past. If you are reluctant to accept your fate, you will probably make many more mistakes and make your life miserable. Everyone has a field to cultivate inside their minds. You must first weed it before you sow the seeds. You must first get rid of bad habits and worries before you can sow seeds of wisdom. Only when that mental field is clear of weeds can the seeds of wisdom take root. This is spiritual cultivation. Respect Mother Nature, your mental field within, and all the people and things around you. If you can choose what is good and hold fast to it, then that is a display of wisdom. You can thereby become the master of your life and not be controlled by fate. Fate is not immutable. Once you are able to change your mindset, you will be able to turn your fate around. Life may be fleeting and impermanent, but you can use this life to broaden your Great Love to infinity. When you devote time and energy to serving society, you will be truly giving your offspring a better future. As I bid farewell to the old year and greet the coming of the new year, I would like to take this opportunity to express my gratitude to everyone. I am grateful to all of you for grasping the opportunity in this life to walk on the Path of the Bodhisattvas, helping relieve people of suffering, and giving joy to the needy. By helping others, you make your lives more significant and invaluable. A single day is made up of 86,400 seconds. Only when you pass each second safely will you be able to pass a whole year peacefully. So you must truly be grateful that you have enjoyed a safe year. To enjoy a peaceful life, you need to discipline your mind and guard it against the five pollutants: greed, anger, delusion, arrogance, and doubt. If you allow yourself to be tormented by these five pollutants, it is very possible that you will cause disharmony and disturbances in your family, society, and even the world. You must welcome the future with a pious heart. When you are grateful to every thing and every creature in this world and respect every person you encounter, then naturally you will help bring about harmony, become a stabilizing force in society, and help keep danger and calamity at bay. May you seize every moment this year to recruit more living bodhisattvas in the community where you live. The more good people there are, the more happy families there will be, and our society will become more peaceful. I bless you all!
" If we can reduce our desires, there is nothing really worth getting upset about. "